Here is a place dedicated to the actress's life and work. Besides a Biography and a Filmography you will find a Gallery that will give an impression of Barbara Hale and her work in Hollywood. Diese Seite ist der Schauspielerin und ihrem Leben gewidmet. Neben einer Biographie und einer Filmographie findet sich hier eine Galerie, die einen Eindruck von Barbara Hale und ihrer Arbeit in Hollywood vermittelt. Este es el lugar dedicado a la vida de la actriz y su trabajo. 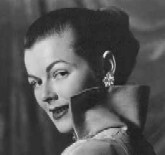 Ademas de su Biografia y Filmografia, encontraras la Galeria, que te darÃ¡ una impresion de Barbara Hale y su Carrera en Hollywood. [A password is required to deter spammers. This is *not* an official site of Barbara Hale. It's a Fansite; done by a fan as a service for the fans. Special thanks to Dave for ("technical") support, motivation and endless patience. Without him this site wouldn't exist! Further thanks go to Leslie for proofreading, support and hints. Not to forget Mariali! Gracias Amiga for translating the site into Spanish!